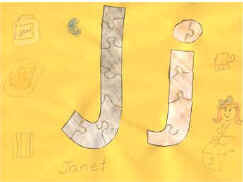 Alphabet Ideas: The Letter J Activities! The Jungle Mobile and Jungle Scenery Cut and Paste crafts are both great choices! WHAT WE DO - ACTIVITIES: Make your own juice. It's amazing how many oranges it takes to make a glass (and sure does increase one's appreciation for drink crystals). But the kids have lots of fun squeezing the oranges themselves. And it's a great excuse to make mommy a surprise breakfast in bed!!! WHAT WE DO - FOOD: Try out a new kind of Jam or Jelly. There are about a million flavours out there, so let your kids pick a new one during the weekly shopping trip!